Charlie Gard’s parents want to take him to the US for an experimental treatment – which the courts have repeatedly ruled against. 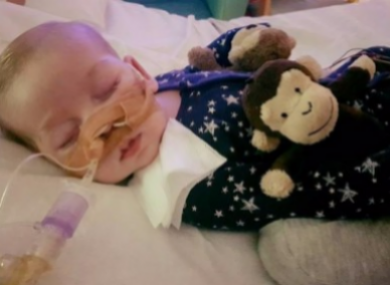 PRESIDENT DONALD TRUMP has offered to help Charlie Gard – a baby with a rare genetic disorder who is due to be taken off life support after courts ruled further treatment would prolong his suffering. “If we can help little #CharlieGard, as per our friends in the UK and the Pope, we would be delighted to do so,” he said in a tweet. The parents of Charlie Gard, who is 10 months old and has brain damage, had been fighting to take him to the United States for an experimental treatment for his extremely rare form of mitochondrial disease, but lost their case in British courts and the European Court of Human Rights. “President Trump has offered to help the family in this heartbreaking situation,” Helen Ferre, White House director of media affairs, said in a statement. The Italian term used – “curare” – can be translated as “care for” or “treat” but the Vatican press office could not provide an official translation into English. Thanks @realDonaldTrump for your support – @theresamay do the right thing and #savecharliegard. Email “Donald Trump offers help to baby whose life support is to be switched off”. Feedback on “Donald Trump offers help to baby whose life support is to be switched off”.